Look at the flames of the Dondo fire ! Fudo Myo-O is quivering in the flames ! Let us fold our hands in prayer ! Dondoyaki　どんど焼、sagichoo 左義長, saitoyaki 賽燈燒,　紫灯、寒灯. During these fire festivals around the 14 and 15 of January, the New Year decorations are burned, for example the ritual ropes, Shimenawa. was one of the last great masters of the Japanese ukiyo-e style of woodblock prints and painting and belonged to the Utagawa school. He was born in 1797, the son of a silk-dyer, originally named Yoshisaburō. Apparently he assisted his father's business as a pattern designer, and some have suggested that this experience influenced his rich use of color and textile patterns in prints. 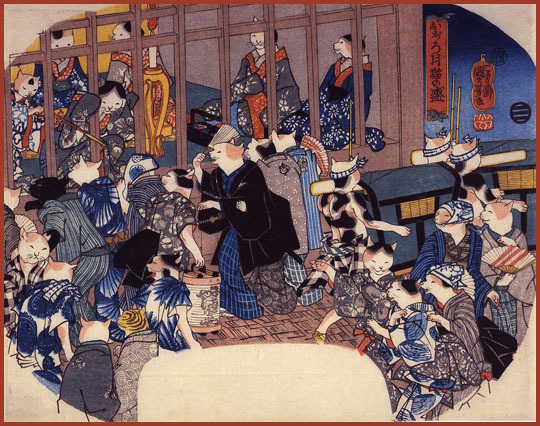 It is said that Kuniyoshi was impressed, at an early age of seven or eight, by ukiyo-e warrior prints, and by pictures of artisans and commoners (as depicted in craftsmen manuals), and it is possible these influenced his own later prints. His economic situation turned desperate at one point when he was forced to sell used tatami mats. 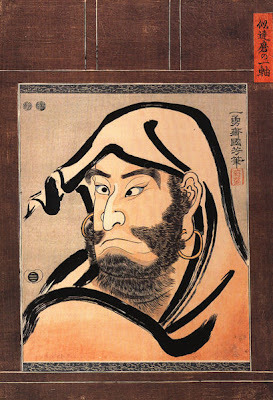 A chance encounter with his prosperous fellow pupil Kunisada, to whom he felt (with some justice) that he was superior in artistic talent, led him to redouble his efforts (but did not create any lingering ill-feeling between the two, who later collaborated on a number of series). During the 1820s, Kuniyoshi produced a number of heroic triptychs that show the first signs of an individual style. In 1827 he received his first major commission for the series, One hundred and eight heroes of the popular Suikoden all told (Tūszoku Suikoden gōketsu hyakuhachinin no hitori), based on the incredibly popular Chinese tale, the Shuihu zhuan. In this series Kuniyoshi illustrated individual heroes on single-sheets, drawing tattoos on his heroes, a novelty which soon influenced Edo fashion. The Suikoden series became extremely popular in Edo, and the demand for Kuniyoshi’s warrior prints increased, gaining him entrance into the major ukiyō-e and literary circles. 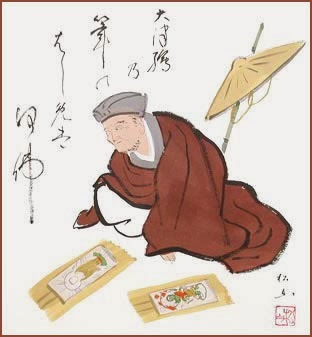 He continued to produce warrior prints, drawing much of his subjects from war tales such as Tale of the Heike (Heikei monogatari) and The rise and fall of the Minamoto and the Taira (Genpei seisuki). His warrior prints were unique in that they depicted legendary popular figures with an added stress on dreams, ghostly apparitions, omens, and superhuman feats. This subject matter is instilled in his works The ghost of Taira Tomomori at Daimotsu bay (Taira Tomomori borei no zu) and the 1839 triptych The Gōjō bridge (Gōjō no bashi no zu), where he manages to invoke an effective sense of action intensity in his depiction of the combat between Yoshitsune and Benkei. These new thematic styles satisfied the public’s interest in the ghastly, exciting, and bizarre that was growing during the time. In the late 1840s, Kuniyoshi began again to illustrate actor prints, this time evading censorship (or simply evoking creativity) through childish, cartoon-like portraits of famous kabuki actors, the most notable being "Scribbling on the storehouse wall" (Nitakaragurakabe no mudagaki). Here he creatively used elementary, child-like script sloppily written in kana under the actor faces. 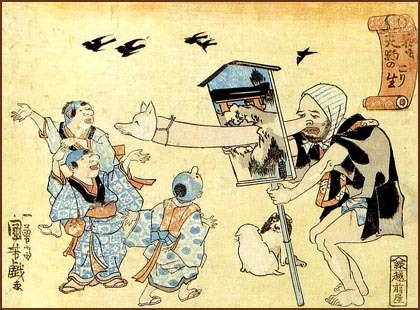 Reflecting his love for felines, Kuniyoshi also began to use cats in the place of humans in kabuki and satirical prints. He is also known during this time to have experimented with ‘wide-screen’ composition, magnifying visual elements in the image for a dramatic, exaggerated effect (ex. Masakado’s daughter the princess Takiyasha, at the old Soma palace). In 1856 Kuniyoshi suffered from palsy, which caused him much difficulty in moving his limbs. It is said that his works form this point onward were noticeably weaker in the use of line and overall vitality. Before his death in 1861, Kuniyoshi was able to witness the opening of the port city of Yokohama to foreigners, and in 1860 produced two works depicting Westerners in the city (Yokohama-e, ex. View of Honcho, Yokohama and The pleasure quarters, Yokohama). He died at the age of 65 in March of 1861 in his home in Genyadana. 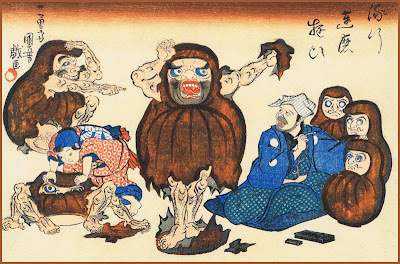 Woodblock prints by Kuniyoshi .
. . . CLICK here for more Photos - Kuniyoshi Tengu ! ! 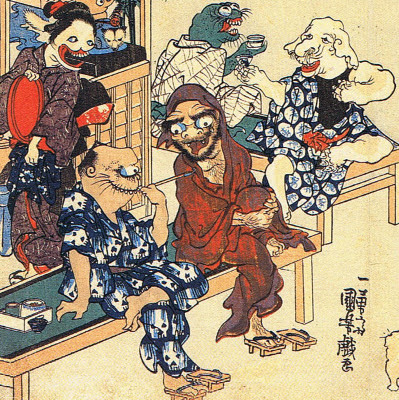 Kyôga tengu no korishô - Tengu no hana Tengu and their noses"
CLICK for more of his Tengu paintings - 歌川国芳 天狗　! After the imposition of a ban on actor prints in 1842, Kuniyoshi produced numerous humorous designs with thinly disguised actors’ portraits. In this series, well known actors are portrayed as Daruma, without any mention of their names. This series is listed as number 191 in Kuniyoshi by Basil William Robinson (Victoria and Albert Museum, London, 1961). The prints in this series are each about 14 by 10 inches (36 by 25 centimeters), a size known as ôban. Kuniyoshi Utagawa is a late Edo period ukiyo-e artist whose fantastic motifs have received renewed critical attention in recent years. Full of a playful, ludic spirit, his works feature cats, warriors, huge monsters and fantastical creatures. A selection of these works were shown last spring in London, and later traveled to various European cities before ending up in New York this spring. This exhibition features over 230 of Kuniyoshi's works over two parts. There have been several exhibitions of the 19th-century ukiyo-e (woodblock print) artist Utagawa Kuniyoshi in recent years. 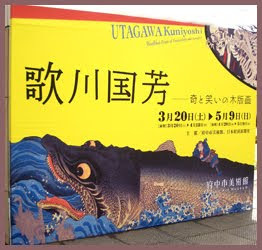 In 2009, there was "Woodblock Prints of Eccentricity and Laughter" at the Fuchu Art Museum and last year we had "Utagawa Kuniyoshi: Unparalleled Ukiyo-e Artist" at the Ota Memorial Museum. Both shows were quite comprehensive and treated Kuniyoshi with all the respect accorded a major artist — as he is now considered to be. This year, we have the grandly titled "Kuniyoshi: Spectacular Ukiyo-e Imagination." With 420 works, it claims to be the biggest exhibition of the artist's works yet, and seems designed to elevate him to a level equal to the likes of Katsushika Hokusai. But, while the show is ostensibly impressive and awe-inspiring, it does little to develop our understanding of the artist, falling back on the uninspiring narrative of a polymorphously creative individual in overdrive. The breathless buzzwords in the title give it away. These are echoed by the exhibition's publicity, presentation, and catalogue, which show a tendency to gush over its subject in prose that reveals hard-sell intent more than curatorial insight. 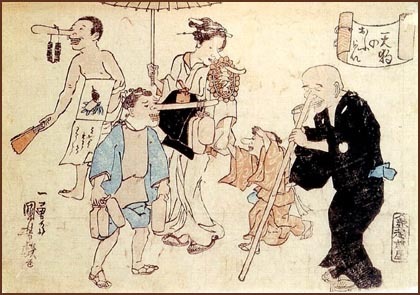 "Variety was Kuniyoshi's watchword in technique as well as subject matter," exclaims a typically overloaded phrase in the catalogue's English essay. This is closely followed by the information that Kuniyoshi "explored developing compositions from a multiplicity of perspectives," conjuring up a picture of the artist sketching while standing on his head, and the assurance that his "wide screen compositions" are "particularly spectacular." The vision of the artist that the curators are presenting is of some irrepressible fount of pure creativity who just happened to burst forth in the Edo Period (1603-1867) and who must be worshipped without question. Of course, they might very well be onto something. As you pass through the exhibition, you are bombarded with what seems like an endless stream of unexpected and innovative imagery. Pictures of warriors fighting battles and monsters, give way to epic scenes with giant ghosts and whale hunts, which in turn lead to depictions of holy men and paragons of virtue. Kimono-clad beauties delight our eyes, then give way to landscapes and pictures of anthropomorphized animals and objects, followed by trick pictures using ambiguous silhouettes and tiny human figures arranged to create the image of larger faces. A one-trick pony, Kuniyoshi certainly wasn't! After this colorful carousel, the point of least resistance is to just surrender to the idea offered, of Kuniyoshi as the incarnation of pure "boundless imagination." The problem with this, however, is that it is ultimately an unsatisfying narrative as it merely places the artist behind a curtain of blind adoration that ignores his failings as an artist — some of his pictures are hopelessly cluttered and compositionally weak — as well as the elements that tie him to his era. Daruma Story for a Spooky Night .
. 歌川国芳 達磨 Kuniyoshi and Daruma . Utagawa Shigenobu (1826-1869) was the chief pupil of the the second great master of the Japanese landscape woodblock print, Hiroshige. He took over his master's go 'Hiroshige' on the latter's death, and is now principally known by it, being more usually referred to as 'Hiroshige II'. He was born into a family of fire-watchmen, like his master Hiroshige I. He was originally named Suzuki Chimpei, and as his artistic career began, he was given the name Shigenobu (重宣) by his master Hiroshige I. He was made part of his master's household, and married Hiroshige I's daughter Tatsu. 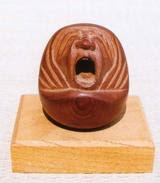 When these prints became more popular, Daruma was one of the common features in them.
. Memorial Days of Famous Poeple . "Fifty-Three Stations of the Tokaido"
"Famous Places of Edo: A Hundred Views"
was the second of the two great masters of the Japanese landscape woodblock print, after Hokusai. He is particularly known for his scenes featuring snow and rain, which feauture in many of his best and most famous images, and which has led to his becoming know as "the artist of rain, snow and mist". He was born (with the name Ando Tokutaro) in Edo (the name of Tokyo at that point in time), and originally was intended to follow the career of his father, a fire-watchman. After his parents' death in 1809, the orphan Hiroshige gravitated toward the art world, an inclination which had been encouraged by his father. Primarily from the Hoeido and Reisho Editions"
A popular subject of literature and art during the Edo Period (1603-1867) was the journey along the Tokaido highway between Edo (present-day Tokyo) and Kyoto, the most famous depictions of which come from ukiyo-e (woodblock print) artist Utagawa Hiroshige (1797-1858). Hiroshige produced more than 20 editions of these works, one of which is known as the Hoeido — 55 oban (26.5×39 cm) full-color prints depicting all 53 stations along the highway.
. Mentioning Hiroshige in the Daruma Museum . Look at more than 5000 of his prints! A disciple of the Historical Buddha, Monju represents wisdom, intelligence and willpower. 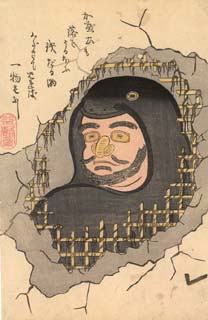 In artwork, Monju is often portrayed with a sutra in his left hand (a symbol of wisdom) and a sword in his right (to cut through illusion), but not always. Sometimes Monju carries a lotus flower and is riding a Shishi (mythical lion). 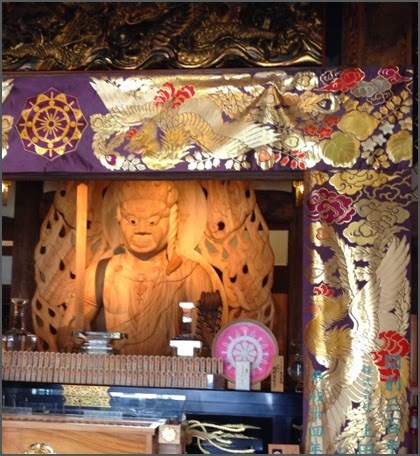 Read all the Details from Mark Schumacher.
. Koofukuji 興福寺 Temple Kofuku-Ji Nara . 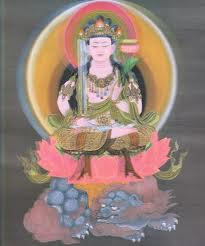 Manjuvajra (Monju) carries a blue lotus, utpala, in his upper hand. 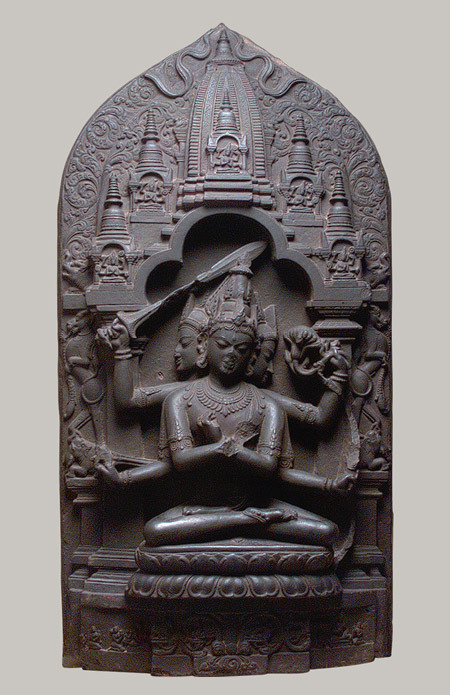 The central hands are crossed in front of his chest, symbolizing the union with his female deva. Manjushri is known to live in the Paradise of the Five-Peak Mountain (Wu-tai-shan, China)or in the Vimla (Yuima) paradise in the East. 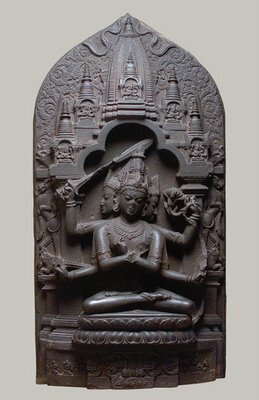 In this sculpture, he sits in a temple-like building, surrounded by five more temple towers around his head. This formation symbolizes the four heavenly directions with the center (pancha sikha, five peaks, five crests). 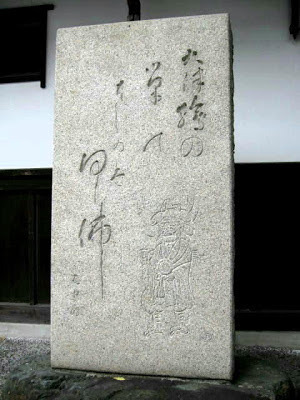 The figure of Monju is closely related to the number FIVE. We have statues with five hairknots, five signs or five companions. Copyright © 2000–2006 The Metropolitan Museum of Art. In From Outcasts to Emperors, David Quinter illuminates the Shingon Ritsu movement founded by the charismatic monk Eison (1201–90) at Saidaiji in Nara, Japan. 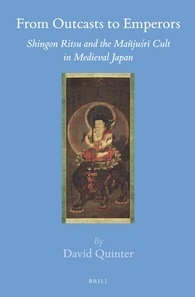 The book’s focus on Eison and his disciples’ involvement in the cult of Mañjuśrī Bodhisattva reveals their innovative synthesis of Shingon esotericism, Buddhist discipline (Ritsu; Sk. vinaya), icon and temple construction, and social welfare activities as the cult embraced a spectrum of supporters, from outcasts to warrior and imperial rulers. In so doing, the book redresses typical portrayals of “Kamakura Buddhism” that cast Eison and other Nara Buddhist leaders merely as conservative reformers, rather than creative innovators, amid the dynamic religious and social changes of medieval Japan.
. Cultural keywords and kigo used by Issa . There are various halls with this name in Japan. "Glückhafter Jüngling." Lautmalerische Abkürzung für "Monjushiri". Stellt Wissen, Weisheit und Erleuchtung dar. Nach dem Tode des Shakyamuni in Indien geborener Mensch, durch Askese zum Bosatsu geworden. Besonders in Tibet, Nordchina und der Mongolei (Mandschuria > Manjuria > Monju) verehrt. Er schenkt Weisheit in allen Lebenslagen, nicht nur reine Intelligenz. Beliebt auch in der Zen-Sekte, da er das aus der Erleuchtung kommende Wissen verkörpert. Häufig in der Zazen-Übungshalle für junge Zen-Mönche aufgestellt. Ein typisches japanisches Sprichwort lautet: Wenn drei Menschen zusammenkommen, sind sie so klug wie Monju (sannin yoreba, Monju no chie　三人寄れば文殊の知恵). Die Geschichte über seinen religiösen Disput mit Vimalakirti (Yuima　維摩 ) wird im Sutra Yuimakyoo　維摩 (ゆいま) 経　beschrieben. Rechts im Westen einer Shaka-Dreiergruppe, zusammen mit Fugen Bosatsu. Mit Schwert in der rechten und Sutrarolle in der linken Hand als Symbole höchster Weisheit und Erkenntnis. In Zen-Klöstern oft in Priestergestalt in Meditationshaltung, mit Sutrarolle, Sutraschatulle oder Lotusblüte. Im esoterischen Buddhismus seit der Heian-Zeit auf einem Lotussockel auf einem Löwen reitend (Monju Kishizoo 文殊騎士像). Auch mit Asketengewand, unter dem sich eine chinesische Rüstung befindet. Je nach der Zahl der Buchstaben seines Mantra - eins, fünf, sechs oder acht, hat die Figur entsprechend viele Haarknoten und trägt bestimmte Gegenstände in den Händen. Monju mit einem Zeichen (Ichiji Monju　一字文殊): linke Hand - wunscherfüllendes Juwel, rechte Hand - Weidenzweig. Monju mit fünf Zeichen (Goji Monju　五字文殊): linke Hand - grüne Lotusblüte, auf der eine Sutraschatulle liegt, rechte Hand - Diamant-Schwert (kongooken). 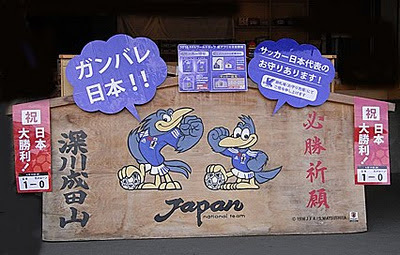 Auch als "Monju mit fünf Haarknoten" (Gokei Monju　五髻文殊 ) dargestellt. Monju mit sechs Zeichen (Rokuji Monju): linke Hand - zur Brust erhoben, Handfläche nach oben, rechte Hand - Geste des Rades der Lehre.
. Rokuji 六字 the power of Six Words . Monju auf einem Löwen sitzend; der Löwe steht auf Wolken und durchquert das Meer auf dem Weg nach dem Berg Wutai in China. In Japan auch über das Meer von China nach Japan interpretiert. Siehe auch die Monju-Fünfergruppe. Besonders in der Tendai-Sekte verehrt. Der Mönch Ennin brachte in der Heian-Zeit ein Abbildung aus dem Kloster am Berg Wutai (Godaisan Monju) aus China mit nach Japan. Nach diesem Vorbild, eigentlich einem "Monju über das Meer kommend", entstand die Monju-Fünfergruppe. Nach Hama sitzt Monju auf einem Lotussockel auf einem Löwen, neben ihm stehen Udenoo (Utenoo), Basuu Sennin, Zenzai Dooji und Buddhahari Sanzoo. Sudhana (mit gefalteten Händen) weist den Weg, Udenoo in chinesischem Gewand hält die Zügel und zwei Heilige, Buddhahari (im Priestergewand) und Taisei-Roojin (mit einem Kopftuch) laufen nebenher. Junger Mann oder kindliche Gestalt mit Schwert und langstieliger Lotusblüte in der Hand, auf einem Lotussockel auf einem Löwen oder direkt auf dem Löwen sitzend. 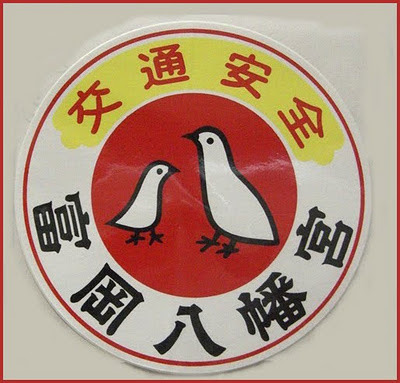 Haare in fünf Knoten (gokei　五髻) aufgebunden, als Symbol der fünf Zeichen des Monju-Mantras. In dieser Gestalt auch in der Dreiergruppe mit Shaka Nyorai und Fugen Bosatsu. Monju erscheint in der Figur eines alten Priesters in Klöstern, um die Lehre und die rechten Vorschriften für die Mönche zu erläutern. Statuen eines alten Priesters, meist in den Refektorien der Zen-Tempelklöster aufgestellt. Der japanische Priester Gyooki (Gyoki　行基) soll eine Inkarnation des Monju sein. The Fudo Hall in Fukagawa was the "Edo Branch" of the famous Fudo in Narita. This temple is Nr. 12 in the Kanto Fudo Pilgrimage.
. Pilgrimage to 36 Fudo Temples in Kanto / Bando . Onegai Fudo Sama - Fudo to make a wish . Built as a chokugan-ji on order of 嵯峨天皇 Saga Tenno (786 - 842) by Kobo Daishi. Stretching out in front of Monzen-Nakacho Station on the Tozai subway line is a long, bustling road. Along the way are the grounds where the temple Eidaiji once stood. The temple Naritasan Shinshoji in Chiba began lending a statue of the deity Fudo Myoo to Eidaiji in 1703, a practice it continued nearly every year. Many people gathered to worship each time the statue was placed on display, and there were calls to make the display permanent. In the Meiji era (1868-1912) a replica of the Fudo Myoo statue was brought from Naritasan Shinshoji, and Fukagawa Fudodo was established on the grounds of Eidaiji to house it. On the first, fifteenth, and twenty-eighth of every month, many people gather as dozens of food stalls are set up along the street leading to the temple. This street is lined on both sides with long-established shops selling such familiar products as tsukudani (food boiled down in soy sauce) and traditional sweets. This is a perfect place to get a taste of Shitamachi. If visiting Fukagawa on an ordinary day, a stopover at Fukagawa Fudo temple near Exit 1 of Monzen Nakacho Station is well worth it. A branch of the great Narita Fudo in Chiba Prefecture, Fukagawa Fudo is housed in an Edo-period building moved from Chiba; it's not large, but is impressively decorated with carvings and handsome beams. You may enter the main hall when it is not used for services. The Fudo temple first started renting a corner of Eitai-ji, an influential temple which held sway over most of southern Fukagawa and was closely affiliated with Tomioka Hachiman-gu since the 17th century. After the 1868 ordinance to separate the two religions, Eitai-ji suffered a rapid decline, while the Fudo temple flourished, riding on the patronage of Fudo temples by Kabuki actor Danjuro (Danjuuroo　団十郎).
. Gofunai Nr. 68 - Eitaiji 永代寺 Eitai-Ji . 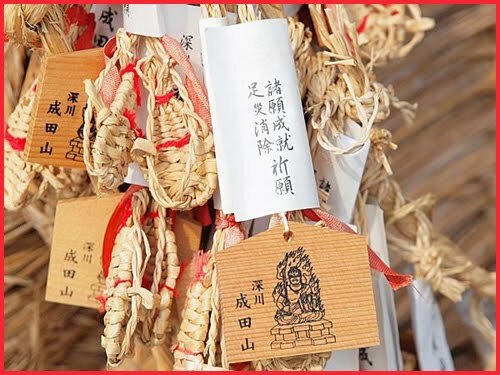 Osame no fudo (year-end fairs) can be found all over town, but the one to watch for this Dec 28 is held at Fukagawa Fudo Temple in downtown Monzennakacho. 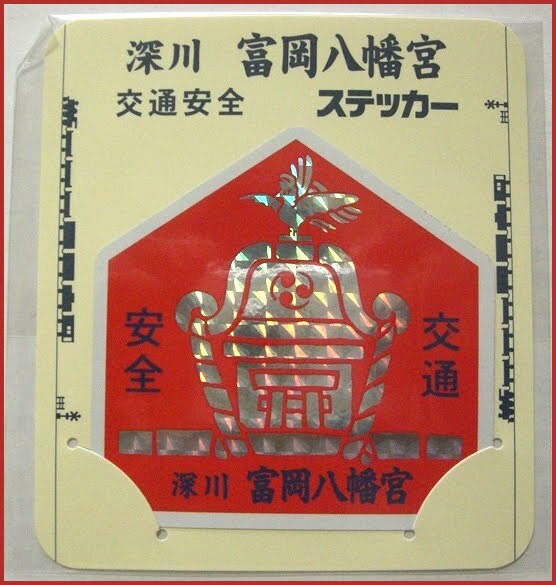 Check out the souvenir shops that line the street leading to the temple, and try some traditional Japanese confectionery or the local specialty, fukagawa-meshi (steamed rice mixed with clams). With next year being the 300th anniversary of the temple, there痴 sure to be plenty going on. 1-17-13 Tomioka, Koto-ku. Tel: 03-3641-8287. Nearest stn: Monzen nakacho. ............................... Osame-Fudo is a kigo for Winter. The temple has fire rituals five times a day. 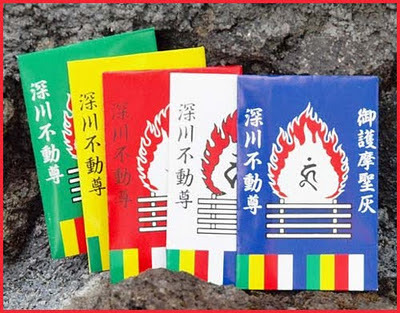 The ashes are put in five envelops with different colors, for the Fudo of Five Colors (Goshiki). The envelops are hung up at the ceiling of the home to prevent fire.
. 江戸の五色不動明王 Goshiki Fudo of Edo . Close by is Tomioka Hachimangu. is in the compound of the temple. After having received a flint for the New Year fire (kriibi　切り火 ) people came to this shrine. They bought this white fox with the wish for a good career. 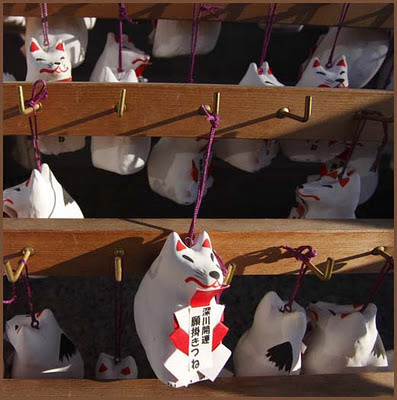 You had to write your wish on a sheet of paper, roll it small and stick it inside the statue of the white fox, which was open at the bottom for this purpose. Now other people could not read your wish and the statue was safely left at the shrine. The priest from the tempel would come over and strike the flint two times over the newly offered fox, making a noise like "katsu katsu" (to win, to win). Now the pilgrim was ready for the new year, with his emotions well in order to deal with the vicissitudes of life. Matsuo Basho lived in Fukagawa, on the other bank of the River Sumida. 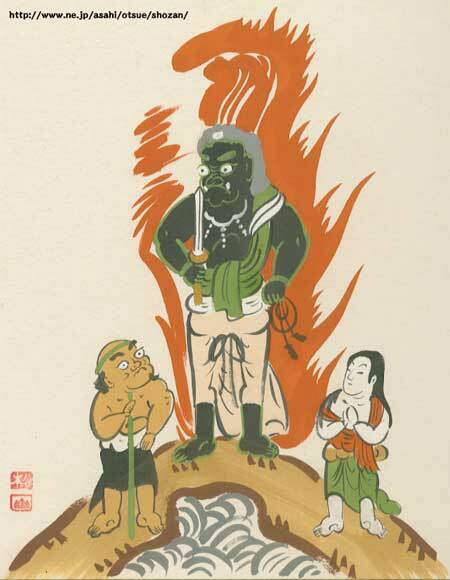 Fudo Myo-O for a good career !
. Shusse Fudoo 出世不動尊 at Fukagawa . shiohigari - gathering shells and small seafood at low tide. Fukagawa had a great flatland tidal area where people could collect cheap seafood. The shrine was founded in 1627 with reclamation of the shoal. 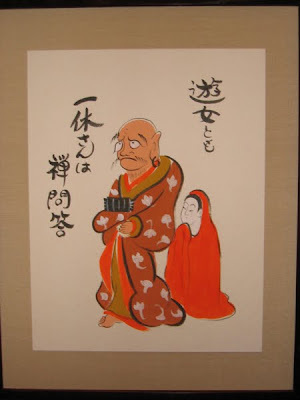 The God Hachiman whom the shrine reveres was also a local Shinto deity of the Minamoto clan thus the shinto shrine received cordial protection by the Tokugawa shogunate. 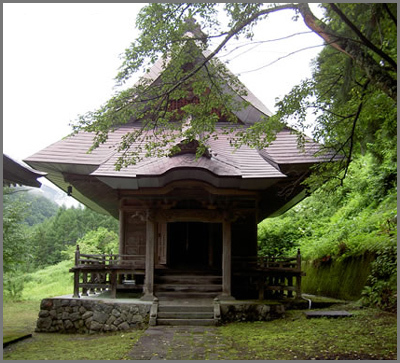 On other hand, the shrine was cordinal revered from the people of shitamachi, and familiar as "Hachiman of Fukagawa". 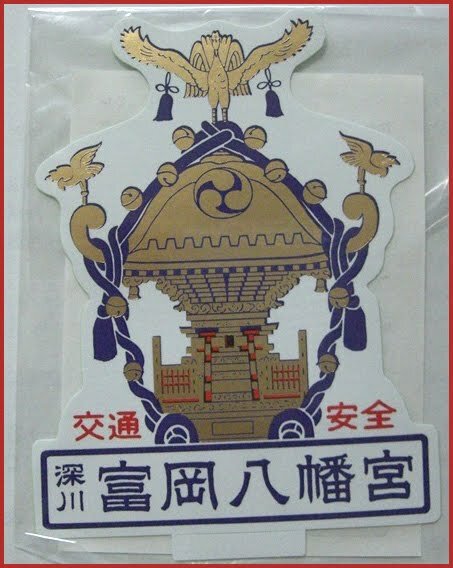 At the Meiji period, the shrine lost the cordial protection like Edo period, but was chosen as Tokyo Ten Shrines (東京十社, Tokyo Jissha) by the Meiji government though it was the one inferior to Hikawa Shrine and other major shrines in the status that the government had provided. Tomioka Hachiman Shrine is also known as the birthplace of Kanjin-zumō (勧進相撲), founded in 1684 and origin of the current professional sumo. Thus, when a rikishi reaches the rank of yokozuna, a dedication in the form of dohyō-iri is done at the shrine. ten important shrines of Tokyo . Fukagawa's greatest shinto shrine is Tomioka Hachimangu. 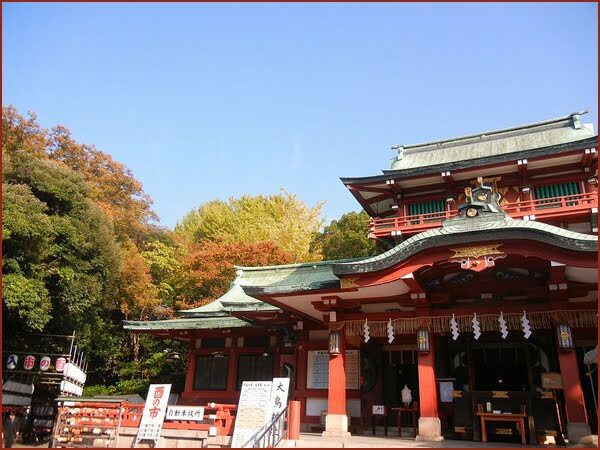 It was established in 1627 and is Tokyo's largest Hachiman Shrine. During the Edo period, sumo wrestlers tournaments were held here . 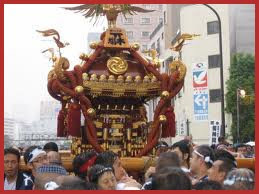 . .
One of the prides of the shrine is its "ichi-no-miya" mikoshi, the biggest "mikoshi" in the Kanto region, weighing 4 tonnes. Before Tokugawa Ieyasu moved to Edo, the Hachiman shrine in this area was located a bit further to the east, in Sunamura. The tiny village of Sunamura is located on a patch of high ground in the midst of the marshes, about five kilometers east of Edo. It is one of the oldest settlements in the area, but remains fairly rural and isolated due to the surrounding marshes. After Ieyasu became Shogun,the government naturally found it necessary to build a much more elaborate shrine, to thank the war god for bringing victory to the Tokugawa family. Therefore the site was moved to its current location and a large group of elaborate buildings was constructed. The shrine now serves not only as a place of worship, but also as the social and commercial center of the whole Fukagawa neighborhood. From the plaza next to the boat landing, a wide avenue leads into the center of the shrine grounds. The path is paved with huge flagstones, and passes through two additional torii gates as it approaches the main shrine building Many smaller buildings dedicated to lesser deities line the avenue. This collection of shrine buildings is one of the largest in Edo. Only the Kanda Myojin shrine is comparable in size. At the far end, on a raised platform of earth surrounded by stone walls, is the Shrine building itself. This huge structure was built in the mid 1600s, after most of the other earthworks and structures in the area were complete. Tomioka Hachiman Shrine remains one of Edo's most important centers of worship. Although the warlike traditions of the middle ages are slowly fading in importance, the shrine to the War God remains very important, particularly to members of the samurai class. Just to the east of Tomioka Hachiman Shrine, separated from the shrine grounds by a narrow drainage canal and a line of pine trees, is a long, broad, windowless building that is a popular destination for any sightseer in Edo. This is the Sanju-San Gendo (Thirty-Three Alcove Temple). Fukagawa Sanju-San Gendo is actually a full-scale replica of a much older temple of the same name, located in Kyoto. Both the site in Kyoto and the one here in Edo are famous for the archery tournaments that take place in the gardens outside the building. Archery has always been one of the main martial arts practiced by samurai. From an early age, young members of the warrior class are taught the skills of swordfighting and archery, as well as equestrian skills. Even today, when war is unheard of and these skills are never used in battle, it is important for all samurai to demonstrate their ability in archery. The Sanju-San Gendo is a center of archery training, and there are almost always some people in the garden taking target practice. Several times a year, the temple is also the site of an archery endurance test, when top champions demonstrate their amazing ability to fire arrows in rapid succession for hours on end. In 1728, one 13-year-old boy set an amazing record that stands to this day. Beginning in the second hour after dawn (about 8 AM) he began shooting arrows without stop. He fired a total of 5,848 arrows without stopping to rest, and only stopped when the tournament was suspended for darkness. This amounts to an average of about one arrow every 5 seconds for an entire day. If that is not already incredible, the official record of the incident states that 5,319 arrows struck the target. Only 529 missed! 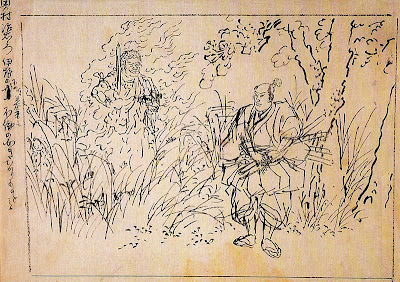 In the garden of the Sanju-San Gendo, the samurai in their fine silk outfits practice archery. In this setting, the art of archery seems almost like a sport, and indeed, that is what it has become. It is almost hard to believe that skill with a bow and arrow was once a matter of life and death. Today, it is more a hobby for the samurai class. Even women can be seen practicing to sharpen their aim.
. kachimamori 勝守 / 勝ち守り to win a battle .
. Amulet for good fishing 釣行安全 . Hachiman festival at Fukagawa, Tokyo .
. Sumo　相撲 Sumo wrestling . - Fudo Myo-O Junrei - Introduction . . 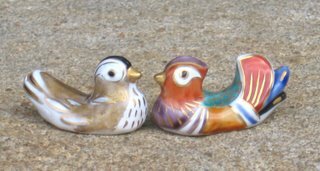 They have survived until today and we find these motives on postcards or ceramics of all kinds. Demons 鬼、Buddhist Deities 仏画、beautiful ladies 美人画、famous warriors 武者絵　and others. Just click on any. The above picture is curtesy to this gallery. 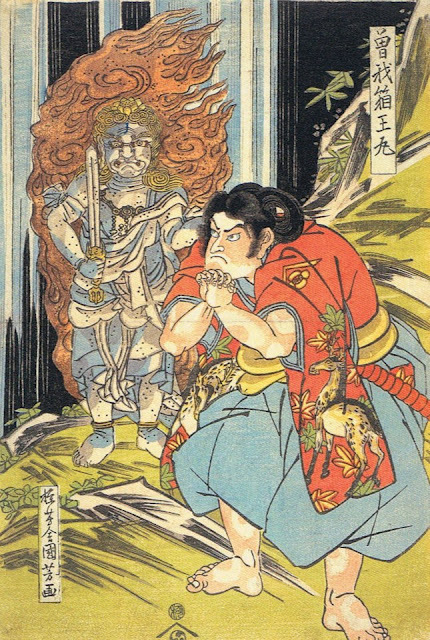 you find the most common topics of Otsu paintings, the little Demon saying his prayers in the cold (oni no kan nenbutsu) is probably the most famous one. The name otsu-e is derived from the place where these paintings were sold, in and around the post town of Otsu, which lay on the Tokaido Road running between Edo (present day Tokyo) and Kyoto. Stands were set along the road to sell these paintings as souvenirs to passing travelers. Created by anonymous artists, the paintings were sold in great numbers for little money. 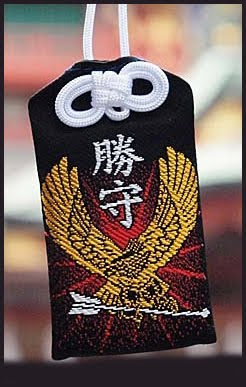 Some of the first otsu-e were created during the Kanei Era (1624-44) following the early Edo persecution of Japanese Christians. 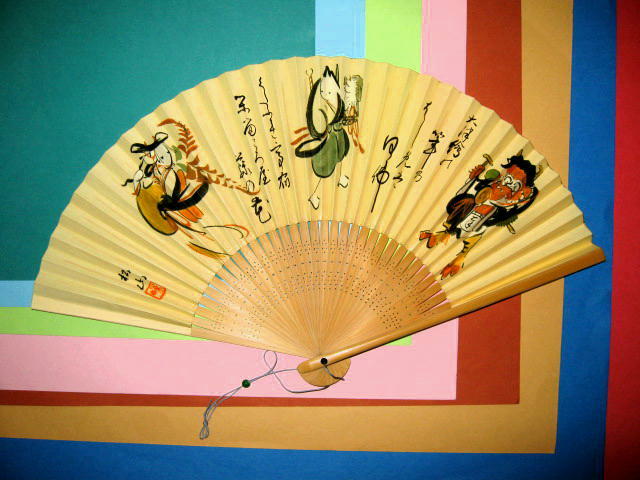 The artwork provided an inexpensive source of Buddhist art that could be displayed in the homes of commoners who feared retribution from the authorities, and needed proof of their devotion to Japanese religious beliefs. 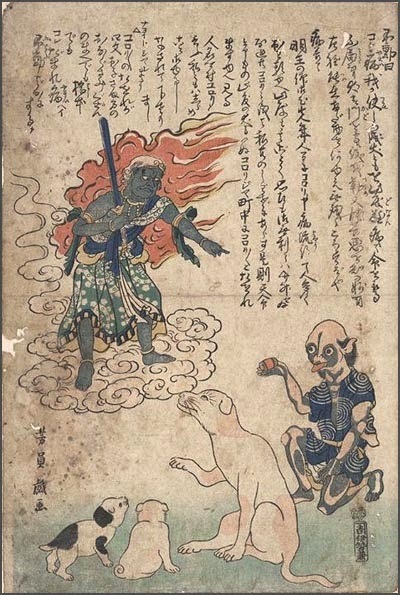 By the end of the Genroku Era (1688-1704), otsu-e had become so popular that their themes were expanded to include depictions of secular subjects, such as beautiful women, courtesans, heroes, animals and mythical goblins. 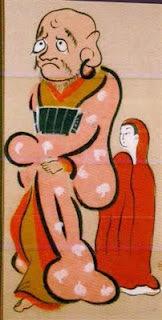 The paintinge also demonstrates the exceedingly simple artistic techniques used to depict the subjects of otsu-e. Usually drawn on plain brown paper, the paintings utilize a limited number of mineral pigments, typically including the colors blue, red, green, yellow and white. 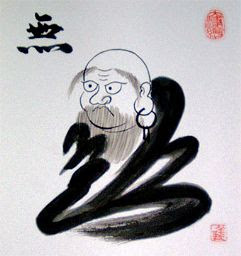 The first stage in creating the paintings was to make an outline in black, which was then filled in with colors in simple brushwork.
. Namazu なまず/ 鯰 catfish in legends and toys .
. Daruma and his earrings . Basho looking at the Otsu-e paintings. by Matsuyama 4th. which Buddha will it be ?
. fude hajime 筆始 first use of the brush .
. Benkei with a halberd 長刀弁慶 - ema 絵馬　votive tablet . as usual an environment with some nostalgic pull is being created here by buson. was the fifty-second of the fifty-three stations of the Tōkaidō as well as the sixty-eighth of the sixty-nine stations of the Nakasendō. It is located in the downtown area of the present-day city of Kusatsu, Shiga Prefecture, Japan. Coming from Moriyama-juku, the borders of Kusatsu-juku started at the banks of the Kusatsu River to the present-day Miya-chō in Kusatsu. 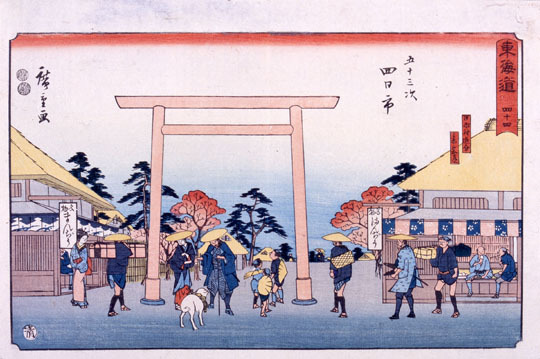 The famed ukiyo-e artist Hiroshige traveled through the post station using both the Tōkaidō and the Nakasendō in order to create woodblock prints. In 1843, the post station had 2,351 residents and 586 buildings. Among the buildings, there were two honjin, two sub-honjin, and 72 hatago. Of the two honjin, one was constructed in 1635 and stood until 1870.That honjin was later repaired and opened as a museum in 1996.